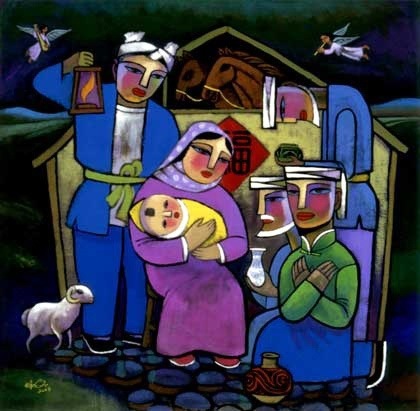 “Look, the virgin shall conceive and bear a son, and they shall name him Emmanuel,” which means, “God is with us.” When Joseph awoke from sleep, he did as the angel of the Lord commanded him; he took her as his wife, but had no marital relations with her until she had borne a son; and he named him Jesus. It was the perfect gift. Carrie had seen this shirt in a magazine that was exactly what her husband would want. She had been listening closely for months for a hint at what he’d like, and this was it. Poised well in advance of Christmas, She went to order it online. His size was backordered. Darn. But, for once, She was early so it looked like it might make it on time. She ordered it. A day later Carrie received an email that said the color She had originally wanted was unavailable. Hm. “It’s still okay,” she thought, “the back-up color is not quite as perfect but it would do. Back-up color it is.” Carrie waited expectantly for the Christmas Shirt to arrive in the mail. The days ticked by and it did not come. She checked online and found the message: “processing order.” She called once or twice to no avail. Christmas came. No shirt. Christmas went. No shirt. By the time the shirt arrived in the mail the tree had been taken to the curb and the decorations put away. Disappointed but eager, Carrie watched her husband open the perfect gift. He lifted the shirt out of the box. It was… a little bright. He put it on. Her heart sank. It was the most obnoxious color green she had ever seen. And the cut was bizarre: tight around the middle, too long. It was a Christmas failure. Carrie looked at her husband and thought she thought she might cry… but then they both started to giggle. It’s not an uncommon experience, is it? We try so hard this time of year to make things perfect. The perfect Christmas Card to send out to family, when the kids are smiling instead of punching each other, with full sets of beautiful teeth and no major scars or bruises on their faces, all wearing matching sweaters. We strive for the perfect decorations and lights, the tree that is equally proportioned and not listing to any particular side. We hunt up and down for the perfect gifts – the ones that will bring joy and delight to everyone on our list. And yet – it rarely works, this striving for perfection, especially around the holidays. Each year we set our sights on making it better – getting started earlier, planning differently – and yet each year some new event thwarts our Perfect Christmas. That first Christmas was far from perfect – everything went wrong. It started with our story for this morning, when Joseph, committed to his lovely bride Mary, found out she’d been unfaithful. You can imagine what it might have felt like, the expectation that his young bride was waiting faithfully for him. They had been betrothed for some time, the standard expectation was that a couple would become engaged and then wait for a year until the bride would move into her husband’s home. And yet the covenant they made was full and serious, and breaking that commitment would mean something closer to divorce than a simple nod and wave. What’s more, if Mary was found to be unfaithful, the Jewish law suggested a penalty of death by stoning. While it seemed that this was not the route Joseph wanted to go, still there was little societal protection for an unwed, pregnant teenage girl. It was no small thing, Mary pregnant by someone other than Joseph. In fact it was a total disaster. Catastrophe. Failure. And then there was this dream. And Joseph finds that this failure, was all in God’s hands.It turned out it was all God’s doing that his marriage had ended up as a deep and utter disappointment. Joseph must have been overwhelmed by a sense of betrayal, fear and hurt, failure. He had said yes to this young girl, this Mary, and look what she has done to him. Can we even imagine? Of course we can. Of course we can imagine that sense of failure, betrayal, hurt. Because those feelings are part of the human experience, they are part of who we are and what we experience, every day. To that infamous mishap with the “reply all” button; the wrong turn that puts us way off course and yet still in a hurry, the shoes that seemed to fit fine in the store but now hurt like heck. Or worse – that dread and fear while you wait for the Doctor’s diagnosis about a pain you ignored for too long. The persistent feeling that you said yes when you should have said no, to that job, that marriage, that move. We make mistakes. We are wrong. We are betrayed and hurt. We are human. Kathryn Shulz is a journalist and author of the book, “Being Wrong: Adventures in the Margin of Error,” and has spent seasons of her life writing and talking about being wrong, something that many of us go to great lengths to avoid. Shulz points out, we also love these stories, we are drawn to these stories: The stories about when we expect one thing to happen, and something else happens instead. Those moments, when our wrong-ness, our failures, our mishaps, caused our lives to move into an entire different trajectory – one that was bound up in mystery and joy. Maybe you thought you would marry your high school sweetheart, move back to the town you grew up in and raise a bunch of kids but, something else happened instead. Maybe you thought you would keep that great job until you retired, save up a bunch of money and then travel the world with your beloved spouse, and something else happened instead. Maybe you thought your children would all be perfectly healthy and “A” students, and something else happened instead. Maybe you thought you’d get into the college that was top of your list, or after you got to college you would finally be truly free and happy and something else happened instead. …and yet so often when something else the new story creates liminal spaces where the holy can enter in and be felt and known and touched. The heartbreak that led to finding your true center. The illness that derailed the life you intended and yet gave you a sense of purpose and gratitude you would never have had, and drew you so closer than you ever expected to the one you love. The child that reminds you every day that there are better things, truer things, more amazing things in this life than perfection – like creativity and authenticity, like joy and laughter. The path you found after that big failure, the one you could not hide, that was finally your path and yours alone. For good or bad, it is so often in our biggest failures, when we have it all wrong, that God can transform it all and astonish us with grace and love. We are only human. We have ups and downs. Failures big and small. And yet God still uses fallible, broken, messy people to accomplish God’s purposes in the world. Even me. Even you. When the angel appeared to Joseph in a dream he must have been at his lowest point. He was about to divorce a woman with whom he expected to spend the rest of his life. The woman whom he had expected to bear his children. He must have felt the world collapsing in on him. And he was told this miraculous story. A story that would change all that he had expected, all that he had hoped for into something more miraculous and beautiful than he could even imagine. Still it would be simple. In fact, it would be another big failure – no room at the inn, born in a stable. A birth just like any other, even lowlier, more ordinary, than any other. And yet in the ordinariness of Joseph’s perceived failure, the Savior of the world would be born. In the name of the Creator and the Christ and the Holy Spirit. Amen.